Handmade feminine Jewelry in Harvest Gold & Chocolate Brown Pearls with Lite colorado Crystals interwoven in beautiful Necklace with 22k gold plated Earrings. When the light hits the gold brown pearls & crystal wedding jewelry the bride really shines. 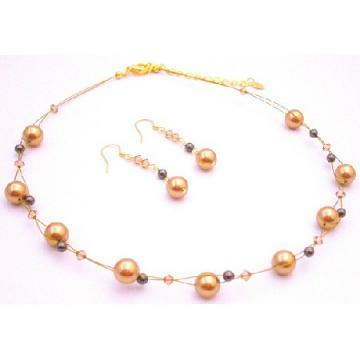 Material Used : Necklace & Earrings - Swarovski 9mm Harvest Gold pearls 4mm Brown Pearls with 4mm bicone Lite Colorado Crystals. Earrings Type : 22k gold plated french hook. Buy Party Necklace Gold Brown Pearls Lite Colorado Crystals , sold & shipped by Fashion Jewelry For Everyone where you can shop online for Leading Online Retailer for Indian Fashion Jewelry. This Necklace Sets collection has been tagged as Party Necklace,Necklace Pearls,Gold Necklace,Gold Pearls,Brown Necklace,Brown Pearls,Brown Crystals,Pearls Necklace,Pearls Crystals,Lite Colorado,Colorado Necklace,Colorado.